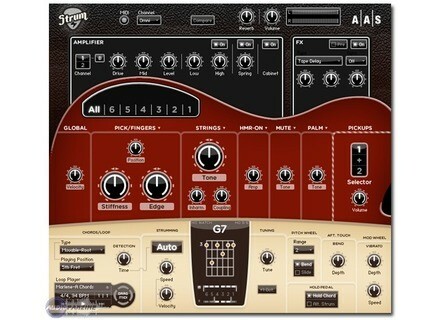 Strum Electric GS-1, Virtual electric guitar from Applied Acoustics Systems. Applied Acoustics Systems will be launching an electric version of its Strum Acoustic GS-1 plug-in at the 2009 Winter NAMM Show. 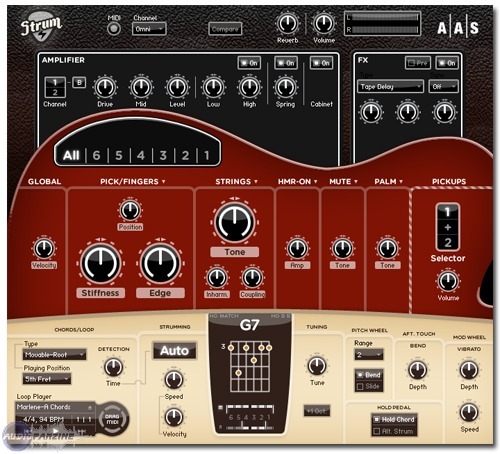 AAS has assured that Strum Electric GS-1 will offer the same strumming and chord detection engines as its acoustic sibling, and will be playable from a MIDI keyboard. The body has been replaced with pickups, though, and a "flexible guitar rig" has also been added to the package. More detail during the NAMM show special coverage on AudioFanzine, and on the Applied Acoustic website: www.applied-acoustics.com, as it gets updated. Microsoft Presents Songsmith You know nothing about music, you can't play an instrument, and can't even use your mouse, but still you're determined to create a song? Songsmith is what you need! Equinox Sounds Cosmic House Equinox Sounds has released Cosmic House, a downloadable loop collection for producing Electro House from Smash Up The Studio. Symbolic Sound's Computers For Kyma The Pacarana and Paca are two new multiprocessor computers optimized for capturing, processing and synthesizing sound for the Kyma Sound Design Environment.